In this session, Thomas Mendel, Managing Director of industry analyst firm Research in Action, presents new findings derived from his recent research into 1500 IT organizations and how they use ITSM and the vendor tools they employ. Hear about the market trends and challenges these ITSM practitioners consider important to their success. And get a glimpse into what the ITSM practitioners think of the top 20 ITSM vendors and the vendor rankings. IT Service Management (ITSM) has a long history of vendors, features, best practices, industry analysts, etc. Likewise, it has a long history in most organizations. But why is it that so few organization have achieved a high level of maturity in ITSM? Why are there so few organizations where ITSM is viewed by executive management, or the business in general, as a mission-critical component to overall business success? In this session, George Spalding, Executive VP at Pink Elephant, explores some of the key ITSM capabilities organizations love to talk about, that can drive maturity and business value, but so few in reality have effectively implemented. Some, like the CMDB, mobility and self-service, have been around for a decade or more, while others like artificial intelligence, machine learning, natural language processing and big data are relatively new. Listen in and learn how to better embrace these capabilities to drive greater ITSM success, maturity and business value. Learn how Intel approached the adoption of Scaled Agile in their Manufacturing Validation Engineering (MVE) organization since 2014, how they leveraged CA Agile Central to enable their trains, and how they overcame the various challenges of quickly deploying Scaled Agile across a large organization. Agile development, DevOps deployments, Lean automations, digital transformation, increased cyber threats and constant change. How does IT keep up? The answer is by becoming what CA calls a “Modern Software Factory” and having a strong IT service management (ITSM) foundation. In this webcast, Darren Arcangel, co-author of the book ITIL® and the Information Lifecycle - Integrating Agile, DevOps and ITSM, explains the Modern Software Factory by exploring the intricacies of how these things interrelate, and the challenges and opportunities they present to ITSM and IT organizations. Learn about how to navigate this complex new world, the KPIs and metrics we now need to employ that can show business and IT value, and how ITSM and ITIL® have and are changing to embrace these changes and enable the Modern Software Factory. We’ve all heard the buzz words: AI, Robotics, Machine Learning. But most of us cannot define them. Few of us know the differences between them or where each one is in their respective development and deployment cycle. We’ve all heard the hype and we have a sense that there is incredible potential for our organizations and even our lives but we are just not exactly sure what or where or how it fits in. How will our existing software tools exploit these new technologies to change the way we do Service Management, IT and business in general? How will these concepts disrupt the value proposition of any Service Provider? How will my job change? Will I even have a job? Join George Spalding, Executive Vice President, Pink Elephant for an in-depth discussion of AI, Robotics and Machine Learning and learn for yourself what’s coming next. Leveraging extensive research data, EMA vice president Dennis Drogseth will examine how ITSM is evolving to become a hub for all of IT, as well as for IT-to-business alignment. He will show unique insights into areas such as integrated asset management, integrated operations and war-room needs, as well as DevOps/agile, SecOps and ITSM’s growing role as a center for IT governance. The webinar will examine how and why this is coming about, as well as what technologies, organizational changes, and process adoptions are critical to furthering the role of ITSM as a hub for transformation. He will conclude with a discussion of the remaining, outstanding obstacles, along with some guidance on moving forward with success. Just like the news, the canvas of ITSM is painted by a cast of “artists”, including the media, vendors, industry pundits and industry analysts. And like those who deliver the news, each spins the story to drive home their point and business objectives. 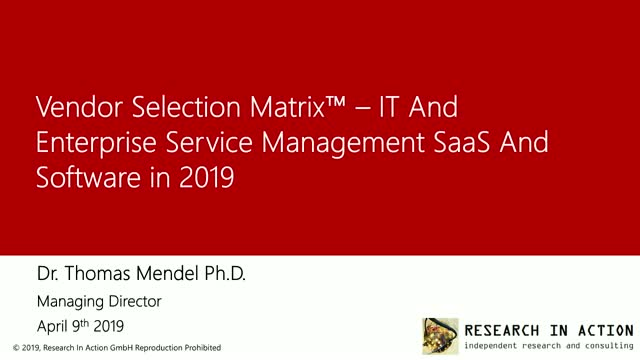 In this session, Thomas Mendel, Managing Director of industry analyst firm Research in Action, presents new findings derived from his recent research into 1500 IT organizations and how they use ITSM and the vendor tools they employ. Hear about the market trends and challenges these ITSM practitioners consider important to their success. And get a glimpse into what the ITSM practitioners, rather than the “artists”, think of the top 20 ITSM vendors. What you hear may surprise you. Don’t miss this one! The way that people work continues to change. New demands exist not only around workplace technologies, but also the physical spaces that people work within. Service management is a practice of importance as it empowers organizations with the capabilities to recognize and respond to changing business demands and in a fashion that mitigates business risks. Additionally, service management practices and technologies help organizations enable and support modern working practices that increasingly embody more mobile and flexible work styles. In this presentation, Ovum senior analyst Adam Holtby will discuss how the way people work is changing in response to digital transformation. Holtby will share findings from recent Ovum research into the digital workplace and discuss why service management practices and technologies are important in supporting enterprises in delivering against digital initiatives. IT has been changing, and continues to do so, in reaction to technology advances and digital transformation. Terms like “application economy” and “modern software factory” have become commonplace in IT strategy discussions. At a more practitioner level, IT has added practices or methodologies like Lean, Agile and DevOps to its arsenal, adding to the constructs set in place with ITIL® to make organizations more effective. Watch this webcast to learn about guiding principles of change, agile sprints, creating an end-to-end operating environment, continuous delivery software pipeline, push-button deployment and KPIs, and how they are impacting ITIL’s evolution in conjunction with these Lean, Agile and DevOps practices. Digital transformation, the Internet of Things, the application economy, the modern software factory, and so on… are all major Business trends impacting the IT service desk and service level management (SLM). Some would contend the service desk is focusing on service operations – not only IT - and SLM is becoming a real business discipline/function. In this webcast, SLM expert fusionPOINT and service desk vendor CA Technologies will look at the impacts of these trends on each and where it is all headed. Learn about the important part proactive and predictive SLM play to enable Digital Transformation and the service desk becoming more predictive, proactive, and business outcome focused. Every organization needs to become a modern software factory. You're developing new capabilities to quickly deliver high-quality customer experiences. You've deployed software that enables rapid development. And you're nurturing an agile mind-set with a primary focus on customers. At some point during this journey, people up the food chain will ask about their return on investment. Do you have a process or framework in place to respond to the question with knowledge derived from quantifiable data? In this webcast, ITSM author Darren Arcangel dives into how ITIL® metrics and continuous service improvement can help quantify this business value. In what CA calls the Modern Software Factory, developers employ Agile methodologies and automate application deployment into Operations via DevOps. Automation tools speed up the delivery of applications into Operations. So how does IT Service Management (ITSM) play in this changed world? How does Operations know that a change to an app has impacted the CMDB? And how do we transform this new information into knowledge for the Service Desk? Please join co-author of the book, "ITIL® and the Information Lifecycle - Integrating Agile, DevOps and ITSM" to learn more about how these pieces all fit together to enable the Modern Software Factory. Seems like there’s a lot of talk and no action when it comes to organizations implementing “proactive ITSM”. With “agile this” and “agile that” pervading IT organizations, one would think “proactive” would be embraced as by definition it provides what’s needed before it’s needed. Well, proactive ITSM isn’t as farfetched as you might think. This webcast explores how infrastructure monitoring, process automation and technology integrations can play a huge role in enabling ITSM to become truly proactive. The result is more time for IT to focus on things that really matter to the business other than just keeping the lights on or resolving problems. Many misconstrue Agile Development and DevOps to mean that there is less need for Change and Configuration Management process. The fact is, oversight and governance of changes is even more critical when more, and often smaller changes are being made at a faster and furious pace. So how does IT keep up? Can we increase speed and maintain stability? The answer is “Yes”, by employing strong change and configuration management that relies heavily on proven process automation and robust integration with the IT infrastructure. This webcast will explore how we need to adapt change and configuration management to keep up in the new “faster is better” world. The answer is Yes and No. The service catalog, once the means for IT to deliver services and assets to business consumers, has become somewhat invisible to those consumers as self-service has become the means to get what they need all in one place. But is IT? IT needs the service catalog more than ever as the number, variety and sources of services and assets has expanded, to a great extent into the virtual. IT must provide services and assets to users faster, cheaper and better than ever. So, while the catalog may be hidden behind a self-service portal, it is still the means for IT to control what services and at what costs services are available and delivered. The “faster” part means that catalog needs to be embraced along with automation to fulfill requests more quickly. Integrations are more critical than ever to ensure user needs are satisfied and SLAs are met by external providers. This webcast will discuss the intertwined relationship between service catalog, process automation and tool integrations that produces increased business value in the new world of better, faster, cheaper IT. Software Asset Management (SAM) plays a critical role in a fast growing, mission-critical use case: Enabling and Strengthening Cybersecurity. In today’s world of mounting external security attacks, we are often too focused on trying to anticipate new threats originating outside our organizations. However, we also, and maybe first, need to look within. One of the first steps in establishing a strong cybersecurity practice involves knowing what you need to protect and where those assets are. Most of the processes and methodologies used in establishing effective SAM should be applied hand-in-hand with your organization’s security protocols to ensure that all parts of your IT enterprise are continually up-to-date and secure from both internal and external threats. This session will address these points and best practices for leveraging SAM to strengthen your cybersecurity. The demands of managing Digital Transformation across the organization involves the alignment of IT suppliers, services and asset inventories, which requires an integrated approach to IT asset and service management. Understanding and aligning the long term value of existing IT services and assets is key to maximizing the commercial benefits of Digital Transformation, ensuring new investments are strategic and add long term business value. This session will explore why building an integrated approach is essential to the success of Digital Transformation, discussing how organizations should architect an ITAM governance, technology and process strategy aligned with ITSM for digital success. Digital business requires an integrated approach to delivering services. The journey from IT service request management to enterprise service management is challenging organizations of all sizes and maturity levels. The traditional IT service catalog is becoming the enterprise service portal, providing access to services, apps, resources, and support. Self-service and automation must blend with higher-touch collaborative interactions and expert support in an end to end flow. Predicting when routine interactions are about to escalate is increasingly essential. Ultimately, a customer-led, data-driven, well-designed experience is needed, to support the high performing digital professional and their team. The consumerization of IT, BYOD and changing service delivery models are driving organizations to transform their approach to Service Management. This is requiring a re-think of the IT front office, emphasizing self-service, improved collaboration and integrated and personalized offerings targeted to their specific audience, available across any device. At the same time, organizations continue to need to reduce costs and drive operational efficiency to free up resources to support innovation and growth initiatives. Join us for one of our many insightful webcasts featuring customers, analysts, partners and evangelists as they talk about how you can transform your complex IT service portfolios into well-managed, optimized productivity solutions that make it easier for business users to get what they need, when they need it, while reducing operational cost and driving greater efficiency. Some sessions will be approved for Personal Development Credits.